Dark spots, acne scars, age spots or patchy skin - all these can make your skin look flawed and uneven. There are many ways to treat pigmentation. You can try peels, lightening creams and other methods. However, a good laser treatment gives more permanent results, like Q-Switch Laser is a treatment to help fight pigmentation. These are all results of pigmentation. Skin and hair get their colors through a pigment called melanin. In correct levels, melanin gives us a healthy complexion. However, many conditions can cause melanin to get concentrated in certain spots, darkening these areas and giving your skin a blemished appearance. Age Spots: As we age, our skin is affected in different ways. It begins to wrinkle and sag, skin gets discoloured, dark spots might appear that look like large freckles. Moles: These are actually caused by melanin that gets concentrated in the certain region, and then it thickens. Post Acne Blemish: These are scars and marks left behind by acne and pimples after they heal. Sun Spots: Skin discoloration caused by overexposure to the sun, without the protection of sunscreens causes sun spots. Melasma: These are dark spots created by a combination of sun exposure and hormonal changes. They are very common women who are pregnant or are taking hormone control medications like contraceptives. While all these can be classified under an umbrella condition called Hyperpigmentation, some of these, like Melasma, may be harder to treat. Superficial discolorations might be treated with topical applications and treatments like chemical peels and lightening creams. Deeper pigmentation like Melasma may not respond so well to these therapies. Laser based treatments are ideal to get rid of persistent blemishes that fail to respond to normal treatments. And Kaya has one of the best solutions for this. 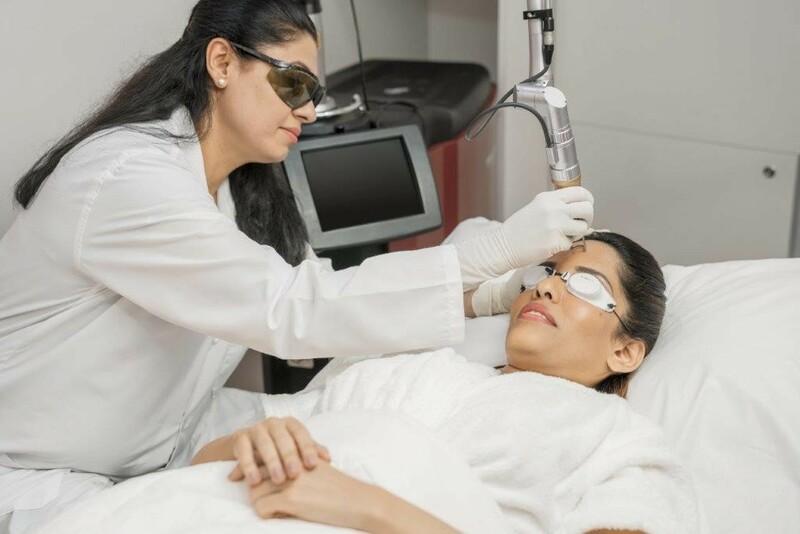 The Insta Clarity Laser or the Kaya's Q-Switch Laser Treatment for pigmentation and is completely safe on your skin. Once you have finished your consultation session with the dermatologist at the Kaya Clinic, you will be advised the proper therapy or products to use for your condition. If the dermatologist feels you will benefit from the Insta Clarity treatment, you will be given a time slot for the first session, if you are deemed a safe candidate (you should not be pregnant, and you should not be vulnerable to cold sores or the herpes simplex virus). This laser therapy uses laser pulses which are released in a billionth of a second, to reduce pigmentation. The pulses hone in on the darker pigments in the discolored spots. They focus on the melanin in these spots and disintegrates it. These are reabsorbed by the body and later disposed of naturally. While undergoing the treatment, you may feel like your skin is being subjected to numerous pin pricks. However, the level of pain is greatly reduced by a stream of cold air that is directed at the target spot which is being treated by the Q Switch Laser. It is normal for the treated region to develop crusts which may last for a few weeks. Apply plain petroleum jelly on these crusts and cover them with gauze. Avoid exposure to sunlight for a few weeks. Eventually, after a few weeks, you will begin to observe a lightening of the pigmentation. To fully eradicate them you will need to attend multiple sessions of treatment. But at the end of it, you will be rewarded with an even complexion and a blemish-free skin. Read Kaya Clinic Reviews online and then go for a consultation to see if you could benefit from the Insta Clarity treatment offered by Kaya Clinics. This procedure is performed by trained professionals under the guidance of dermatologists, so it is safe.